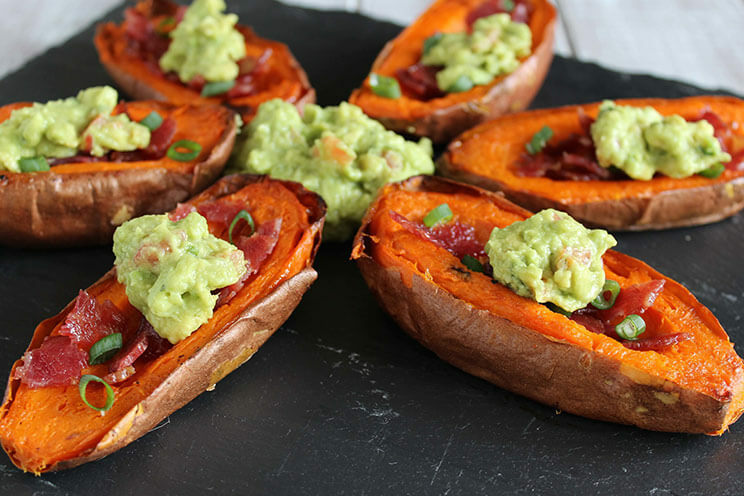 Loaded sweet potato skins are filled with bacon and guacamole! These tasty and satisfying sweet potato skins are perfect Paleo appetizer or even served as a side dish. They are fully loaded and melt in your mouth! Have them as an appetizer on game day, or as a fun snack. It’s a great way to use up leftover sweet potato skins! Thoroughly wash and scrub the sweet potatoes, then pat dry with a clean dish towel. Preheat oven to 400 degrees and lightly grease a baking sheet with coconut oil. Using a basting brush, brush the skins of the sweet potatoes with the melted coconut oil and place on the baking sheet. Bake for 45 minutes, then remove from oven and let cool at least 15 minutes or until cool enough to handle. While the sweet potatoes are cooling lower the oven temperature to 350 degrees. Lay bacon slices on a baking sheet and bake for 15-20 minutes or until they reach desired doneness. Remove from the oven and lay on a paper towel to cool. Once the sweet potatoes are cooled enough to handle, raise oven temperature to 400 degrees. Slice sweet potatoes in half lengthwise. Using a spoon scoop out some of the innards so that you are left with ½ inch of the sweet potato still in the skin. Place the sweet potatoes open-side down on the baking sheet and bake for 6 minutes. Flip and bake for 6 minutes, skin-side down. Crumble bacon slices on top of the potato skins, sprinkle with chopped green onions, and scoop a spoonful of guacamole on top.